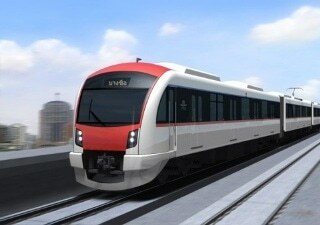 Mitsubishi Heavy Industries, Ltd. (MHI), Hitachi, Ltd. (Hitachi) and Sumitomo Corporation (Sumitomo) were awarded a contract by State Railway of Thailand (SRT) to design and build an Electric and Mechanical (E&M) system, as a full turn-key package, for Red Line Construction Project. The contract price is approximately 32.399 billion Thai Baht and completion of the construction is expected in 2020. MHI will be responsible for design and procurement of systems other than rolling stocks, Hitachi will be responsible for the design and build of rolling stocks, and Sumitomo will be responsible for administration work and the local installation work. In Thailand, the population is mostly dependent on automobile transportation; as a result, traffic congestion, as well as air pollution from the automobiles is getting severe. Therefore, demand for the transportation infrastructure, which achieves mass transit and low carbon, is increasing. Red Line Construction Project is one of the infrastructure investment programs (“Mega Projects”) which the Thai Government is leading. From Bang Sue Station, located in the center of Bangkok, 26.4 kilometer line to the north (North Line) and 14.6 kilometer line to the west (West Line) the project will be constructed as a fully elevated rail system. North Line will be constructed using the JICA’s International Yen Loan, and West Line will be constructed using the Thai Government’s own fund. This contract includes, design and build of trackworks, overhead catenary system, power supply system, signaling system, communication system and rolling stock, and the contractor is responsible to undertake these works on a full turn-key(*) basis. MHI has a robust track record in the delivery of large-scale railway projects, including the Taiwan High Speed Rail and the Dubai Metro, as well as in automated people movers (APM) and other new transportation systems for urban areas and airports both in Japan and overseas. MHI has also constructed and operates Japan’s first comprehensive railway transportation system verification facility, and it will apply its abundant technologies and experience as a transportation system integrator into this project. Hitachi has been offering various rail systems from commuter trains to high-speed trains as a global solution provider. Utilizing its experience gained from various delivery results, Hitachi will provide reliable trains that meet the local needs. Sumitomo has been working on the rail way business globally, especially in South East Asian countries, United States, and Taiwan. Based on this abundant experience of constructing rail way and supplying trains, Sumitomo will move this project forward and fulfill the contract in certain and smooth. MHI, Hitachi and Sumitomo will keep on contributing to the sustainable development of Thailand by combining strength of them to provide safe, convenient and low-carbon Mass-transit system.